Battlefields of the Great War were often littered with unburied dead killed on patrols in No Man’s Land or in the last attack. The recovery of such bodies was often too dangerous to be attempted or if the body was of an enemy soldier the inclination to do it may not have been there. Such sights therefore became quite standard to the average front line soldier. The French Camouflage Service used this fact and constructed their own dead soldiers from papermache and other material. 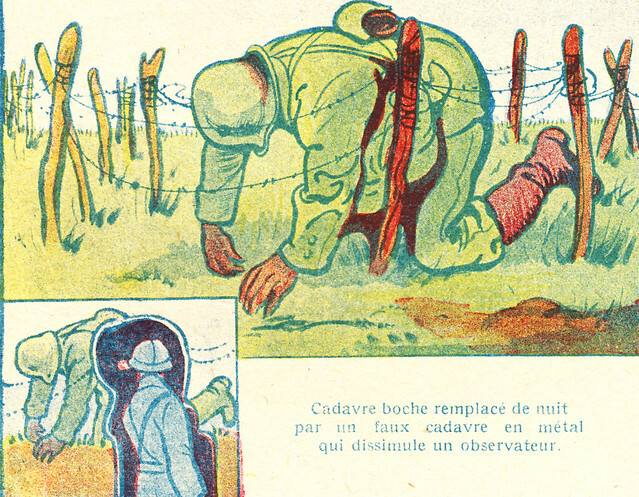 This illustration from La Guerre Documentée shows the dummy body of a German soldier having replaced an actual one on the front line wire close to a French trench. The dummy body is hollow to allow a soldier to gain access to it’s interior and observe from within. Obviously a papermache dummy offered little protection from bullets or shell fire so armoured sheeting was often placed inside or the soldier wore trench armour to protect him. There are images in the archives of the Imperial War Museum showing similar dummies constructed by the Royal Engineers, so it is likely to have been a device used by all sides on the cluttered battlefields of the Great War. This entry was posted on 20/04/2012 by sommecourt. It was filed under France, French Army, French Front, Great War, Verdun, Western Front, WW1 and was tagged with Camouflage, French Army, French Front, Great War, Trenches, Verdun, WW1.